Winner of the 1998 prestigious Mid-American Arts Alliance (MAAA) fellowship, Tadesse Mesfin was born in Weldia, Ethiopia in 1953. He attended the Addis Ababa University School of Fine Arts and Design where he was taught by Gebre Kristos Desta, receiving a Diploma with a distinction. He then attended the Repin Academy of Painting, Architecture & Sculpture in St. Petersburg, Russia in 1984, where he graduated with Honours in a Master of Fine Arts Degree in Painting. 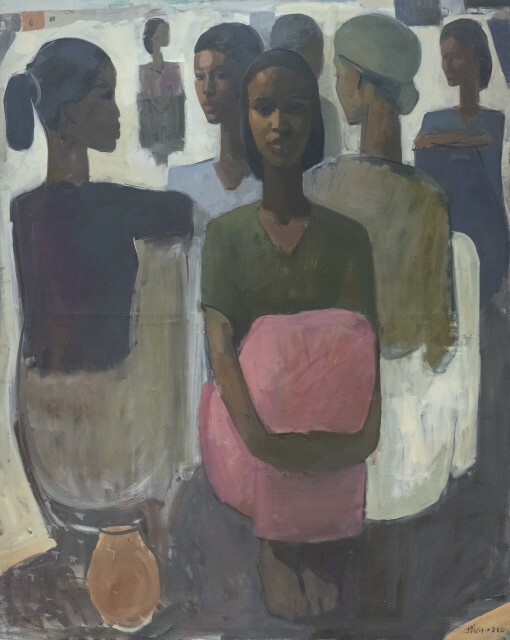 Tadesse Mesfin has spent the last thirty-three years teaching at the Alle School of Fine Art, where he has influenced a generation of painters including, Addis Gezehagn, Dawit Abebe, and Merikokeb Berhanu. His recent works are contemporary interpretations of frontal figures in columnar arrangements, influenced by ancient Egyptian sculptures and mythological drawings, infused with local colours, hinting at eastern Ethiopian cities like Harar. This sculptural arrangement celebrates the women who work as small-holder vendors in several markets around Ethiopian cities. These women typically sit with their goods laid out on the ground in front of them hoping for a custom from the crowd. These current works are reductive and minimal with the women being the sole inhabitants of the canvas. There is a rhythm, a playfulness, between these women, their neutral expressions welcoming interaction with the viewer. Recent solo exhibitions include In Search of Rhythm, Alliance Ethio-Française, Addis Ababa (2014), with his work being featured in group exhibitions such as the Art of Ethiopia, Addis Ababa (2013, 2010), Continuity and Change: Three Generations of Ethiopian Artists at the Samuel P. Harn Museum of Art, University of Florida. Gainesville, Florida, USA (2007) and Four Points: African Contemporary at the Pounder-Koné Art Space in Atwater Village, California (2007). Early in his career, he was also featured in the acclaimed Second World Black and African Festival of Art and Culture (FESTAC 77) in Lagos, Nigeria (1977).